Put some pizzazz in your smoothies with Rio Amazon’s GoGo Guarana seed extract! Feeling sluggish and tired but need to wake up and GoGo? You’ll love the energising boost of Rio Amazon’s GoGo Guarana Powder; the perfect superfood supplement for your smoothies and shakes. For those busy days where you find yourself drinking cup after cup of coffee, Guarana powder will give you a slow release of energy for up to eight hours, keeping you active without turning into a jitter bug! Ideal for use in punches or smoothies, you can even mix your GoGo Powder into juice or water, for a high-octane pick-me-up – anytime, anyplace. Guarana (Paullinia cupana) is a creeping shrub native to the Amazon rainforest that produces clusters of small bright red fruit, the seed of which has been used by indigenous tribes for centuries to boost energy levels and combat fatigue. Similar to the size of a coffee bean, the Guarana seed contains twice as much naturally occurring caffeine than the coffee plant, making it natures best way to catch a buzz! Rio Amazon only employ indigenous inhabitants of the rainforest in order to support local tribal economies and continue traditional production methods. GoGo Guarana Jungle Elixir is made from the highest quality Guarana, which is wild-harvested in northern Brazil by the Guarani Indians who process the seeds into a paste by hand. The Amazon Rainforest is home to more than half (approximately 10 million) of the world’s plant species, providing us with a botanical gold mine of plant-derived medicines. In fact, a quarter of Western pharmaceuticals are derived from rainforest materials, which have evolved unique chemical properties to thrive in this competitive ecosystem. Rio Amazon uphold the strictest standards of identification, harvest and ecological concern when it comes to our rainforests; uncompromising on fair trade and sustainability, the Rio Amazon Collection brings you only the finest quality health products from the Amazon Rainforest. 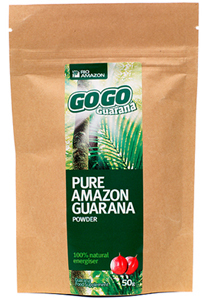 Pure Guaraná (Paullinia cupana) seed powder – finely ground. Dissolve between ½ teaspoon of powder into fruit juice or water and stir well. For best results add just a little liquid (i.e. juice or water) to the required amount of powder and mix into a ‘paste’ – then add this to the full volume of liquid.